Cpl. 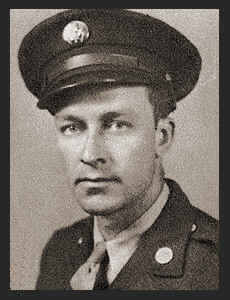 Elmer L. Evans, son of Mrs. May Bilbrey, graduated from Okla. A & M. Entered Army in Feb., 1943, trained in Camp Mackall, N. C., Camp Polk, La., Camp Cooke, Camp San Luis Obispo, Camp Callan, Cal., Camp Miles Standish, Mass. ; served in England, France, Central Europe, the Pacific and Germany, where he was wounded in action in April, 1945. Awarded Good Conduct Medal, ETO Ribbon with Battle Stars, the Purple Heart, Asiatic Pacific Ribbon with one Battle Star, Victory Ribbon, Combat Inf. Badge.